Hi. I own four JVC HR-S9500U's and two of them have recently started having tracking issues with one being worse than the other. I'll describe what's happening with the one that's worse with the probability that the other one requires the same fix. Thank you in advance for any assistance. Any tape that I put in has a consistent tracking roll to it. I'll provide a couple of video links at the bottom of the thread but suffice it to say that whether the tape is SP, EP or LP it shows the video fine for a couple of seconds and then rolls through the tracking. Then it shows the video fine for a couple of seconds and then rolls through the tracking. Repeat over and over. The same tape plays fine in my other two JVC's as well as in my Mitsubishi's. 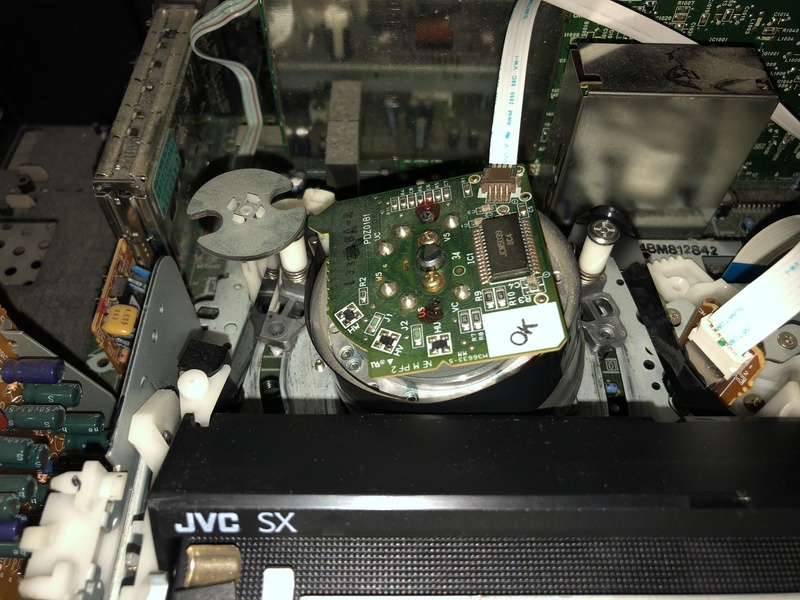 The same problem is happening with one of my other JVC's but it usually only experiences the problem for the first few minutes of a tape and then it clears up. I highlighted usually because there have been a couple of occasions where the problem lasted just a little under an hour before it cleared up. I've cleaned the heads inside the unit. Short of that I'm not a VCR techie so I don't know what else to try. If anyone has run into this and has an idea what the problem is please let me know. I can provide whatever additional information is needed to help diagnose keeping in mind that I'm just an end consumer and not a technician. 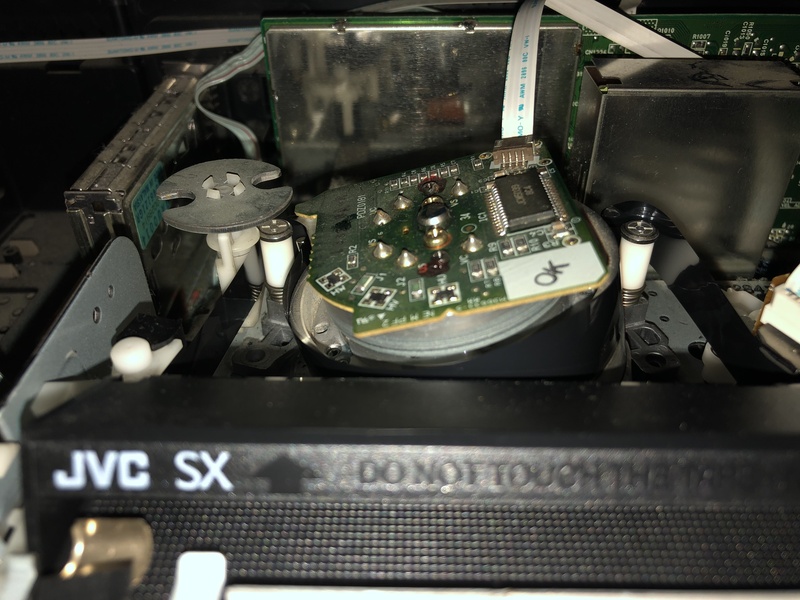 The ribbon cables that go from the video drum to the chassis and from the audio/sync head to the chassis are known to corrode and cause tracking problems, Turn off the unit, remove them and clean the contacts on both sides and put back and see if that was the issue. Thanks for the fast reply and the recommendation. I did as suggested and removed both ribbons cleaning the ends on them. After putting them back on the problem was still there, no better or worse. To rule out a ribbon issue I swapped the ribbons on the screwed up unit with the ribbons on one of the good units. After swapping ribbons the screwed up unit continued with the problem and the good unit continued working as expected. However, there is a new problem which could be related to the initial issue or is the result of me monkeying around with the ribbons. First a disclaimer, except for the switching the ribbons I didn't touch any of the other components so I don't think that I could have created this new issue. I'm very transparent though and if I thought that I could have messed it up I would mention it. The new issue is that tapes now won't load properly. When I insert the tape it attempts to load and then powers off the machine. I've taken a couple of very high res pictures and provided the links below (too large to embed or else the page will take too long to load). As can be seen in the pics the tape is loading too high on the rollers and then rising up on the drum too high. I've also provided a YouTube clip showing this which shows the issue pretty well. Please attach images and clips to the site, high res inside zips, do not use Youtube or an image hosting site. That VCR looks filthy. Obviously never cleaned, zero maintenance in decades. Cleaning heads rarely fixes issues. In fact, it usually makes issues worse, as most people fail to clean it properly. Especially NEVER USE Q-TIPS aka cotton swabs, as those damage heads irreparably. Thanks for the reply, that's all great information. I looked to edit my original posts to remove the links and upload the images/clips but the option to edit is no longer there. I'll keep in mind the correct procedure going forward. One quick question regarding the realignment link that you sent. Is that recommendation to assist with the initial problem regarding the tracking issue or is it recommended to assist with the latest problem related to the tape not loading properly? Or both? Make a new separate post here in this thread, attach everything, and I'll merge it. Paper is still not good, rough fibers. Paper is essentially tree bark, and you're therefore rubbing tree bark on the heads. Use the foam swabs, chamois swabs, or dSLR sensor swabs. And be sure the IPA is 91% or better for heads. That's just a tracking guide. Tapes not loading requires a service manual. And good luck. I even have a deck that refuses to load, and I'm stumped. Remember, I'm not a JVC novice either, you do get familiar with these after 25 years. I know you mentioned cleaning the video drum, Have cleaned the pulse head, It is mounted below the audio head on the same housing? Also does the capstan move freely when no tape is loaded? Looking back at your first video I could hear that squeak when the tape is loading, that problem just gotten worse, I think your cassette is not sitting right which causes the tape to wrap slightly higher than normal around the drum, Don't mess with tracking adjustment until this problem gets fixed first. Thanks for getting back with me, sorry for the slow reply to your posts. I've had a couple of personal things to come up that have kept me from spending any time on the machine but I'll be back to it hopefully in a couple of days. I'll post any updates that I have afterwards. Thanks!